What's the wheel efficiency difference? The Tesla Model 3 comes stock with supposedly aerodynamic wheel covers, which might most kindly be described as ugly. We understand some may take issue with that assessment of their aesthetics, but they would be wrong. Or insane. Or blind. 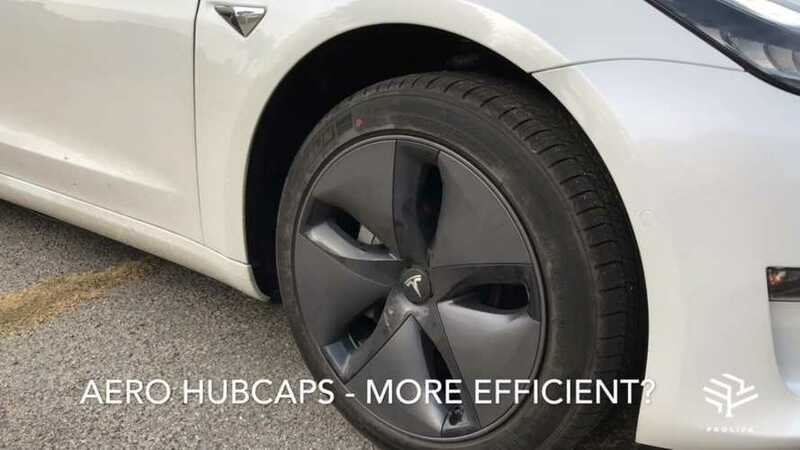 The cover's only redeeming value would appear to be the boost they give to the efficiency of the all-electric sedan, allowing it to squeak out more miles per charge than the perfectly fine wheels that lie beneath the plastic disks. According to Tesla, they increase efficiency (and range) by up to 10 percent. Apparently not satisfied with that answer, one owner, who goes by the name Prolifk on YouTube, decided to put them to the test, to see how much they might improve range in real life. Although he couldn't conduct his tests in a lab or, more appropriately, a wind tunnel, our protagonist took great pains to develop a strategy to reduce the elements that might impact the final findings. A route of 17.5 miles was laid out — from Los Angeles to West Covina, California — and passes made with and without the covers. The tests were timed to avoid traffic, and pains were taken to avoid things like excessive lane changes that might impact the findings. The temperature was 54 degrees Fahrenheit and most of the driving was done at a constant 70 miles per hour. You can see the lengths they went to in the nicely-done video above, but in case you're in a hurry, here are the numbers according to this first trial. Drum roll please. Ok, without the covers, the Tesla Model 3 covered the distance using 282 watt-hours per mile, while with the aerodynamic covers in place, the result was 270 watt-hours per mile. That is definitely an improvement, but not nearly a 10-percent one. In fact, the difference maths out to be a 4.3 percent change. A little disappointing. Unless, that is, you are looking for a reason to drive around with your perfectly lovely 18" standard wheels au naturel. If you're headed out on a long trip, the sin of spending 4.3 percent more energy isn't the worst of crimes. Plus, around town at slower speeds, that difference likely drops even further. So, whatever your preference, don't be afraid to do you. If you prefer the look of the wheel cover — perhaps you've had them color-keyed to the car — then go for it (and don't listen to the haters, even if it's us)! If you don't, still go for it. A conservative driving style could probably eat up the difference anyway.